Syllabus Relevance in GSM1? Salient features of Indian Society; Diversity of India. Define: If question was about cryosphere or sustainable development – we should open by defining those keywords. But here question is about tolerance, love & society- if you start by defining those terms, it’ll look pathetic. Origin: Suitable method for this question- we can give “origin of the issue” i.e. India is a plural and diverse society. Because if India was a homogenous one-language-one-religion society then there was no need of love / tolerance in the first place! India is a vast country with a lot of diversity in her physical and social environment. People of different racial stocks, ethnic backgrounds and religious beliefs have settled down here. While their food habits, dress patterns and languages vary but the spirit of love and tolerance is common elements among all of them. Buddhism and Jainism’s concepts of non-violence are direct corollary to the spirit of tolerance. Sufi saints’ sense of piety, tolerance, sympathy, concept of equality attracts both Muslims and Hindus. Emperor Akbar listened to scholars from different religions at the Ibadat Khana in Fateh Pur Sikri at Agra on every Thursday. He even started a faith called Din-i-Illahi which encompassed ideas from various religions. Parsis were persecuted in Iran, Jews in Hitler’s Germany. But both have inter-mingled with us for several thousands of years and have become an integral part of the Indian society. To increase their cadre strength, the Left-wing extremists (LWE) try to create divisiveness between poor vs rich, Dalits vs upper caste, Tribals/Christians vs outsiders, yet they’re unable to expand their ideological base beyond the Red-corridor and within this Red-corridor they’re struggling to retain existing followers. ISIS could recruit only a handful of misguided youth from India, unlike the western countries where ISIS could not only find more recruits, but also carried out multiple “Lone-Wolf-Attacks” on innocent civilians. Despite the rise of fake news and provocative messages over social media- communal disturbances are usually confined within a small geographical area and are tackled within a short time frame. One matchstick can’t burn the whole India. Whether Tibetans, Bangladeshis or Rohingya- persecuted communities from our neighboring countries always want to enter India- because India are more peaceful than their home nations. Muslims find work as cooks, pony/horse operators and palanquin bearers at Amarnath Shrine. Local Muslims have been instrumental in relief and rescue operations during snow storms, landslides and floods in this area. Similarly, Hindus find work around Sufi Dargahs and Mughal monuments as shopkeepers, guides and tour operators. National holidays on major religious festivals- they create economic opportunities for tourism, restaurants and film industry. People from all religions go out to watch movies of Salman Khan, Shahrukh Khan and Rajnikanth irrespective of whether they’re released on Diwali or Eid, irrespective of the said actor playing the role of a Hindu, Muslim, Christian, Sikh or Dalit. Don’t digress from question by narrating Padmavat movie controversy. Because even if you try to portray that “ultimate release of the movie proves our tolerance”- but unnecessary words will be wasted on an event that is merely a drop in the whole timeline of Ancient to Modern India. Indian society’s L&T sprit, combined with Government’s soft diplomatic power creates economic opportunities in terms of investment, exports and job creation. Our diaspora is not usually persecuted in middle-east or Africa. It’s not uncommon to find Indian-origin persons commanding high positions in the executive and legislative wings of Western democracies. Question had keyword “elaborate”, so it’s a “discussion” type question, therefore answer must end in “summary”, No need to give ‘findings / suggestions’. Barring occasional incidents of violence and hatred, Indian civilization has always celebrated plurality and promoted love & tolerance. This spirit has countered the destructive forces within India and created opportunities for Indians both within and outside our country. Thus, despite the diversity within Indian society in terms of religion, region, caste and language – our spirit love & tolerance has helped all of us to survive, sustain and flourish. My answer has gone beyond 500 words, but in real-exam difficult to recall that many points within given time limit, so automatically it’ll compress down to 250 words. You’re asked to elaborate the given statement about Love and Tolerance. Examiner has not asked you to “CRITICALLY EXAMINE” the statement. Therefore, you should merely ‘discuss’. Meaning, DONOT divert from the discussion by providing “Diagnosis and Solution”. For example.. Body should not contain diagnosis like “Communalism has divided our society for long. It causes belief in orthodox tenets and principles, intolerance hatred of other religions and religious group, distortion of historical facts and communal violence. PAK/ISI Funding hatred. Social media is fueling intolerance. Atrocities against Dalits rising etc. Constitution’s Preamble/ DPSP की पिपुडी: can be played but it looks cliched. 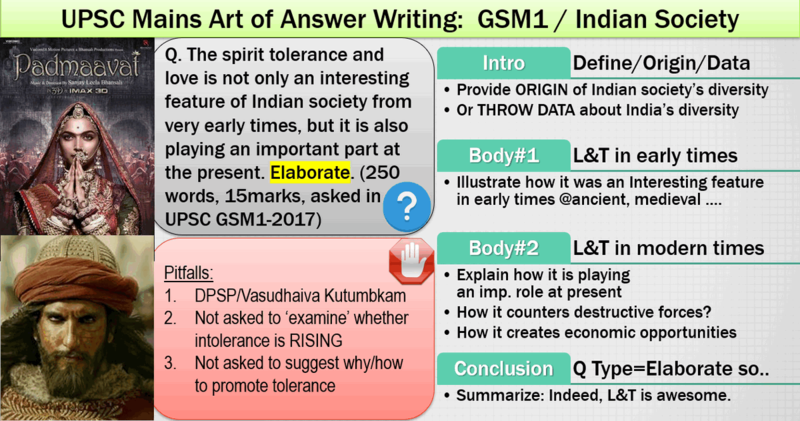 Besides, same GSM1-2017 question paper had another similar question “Distinguish between religiousness/religiosity and communalism giving one example of how the former has got transformed into the latter in independent India.” So if you play the same flute at both places- it’ll harm your impression. In a given question paper, ideally you should not play the DPSP-पिपुडी more than once. Vasudhaiva Kutumbkam, Unity in Diversity की पिपुडी : These are also cliched phrases and expressions. When answersheet after answersheet, examiner sees the same phrase in introduction / conclusion he starts giving average and identical marks to each candidate. Therefore, try to bring some freshness in your choice of words, but that can come only when you read more news columns / magazines, instead of just cramming their bulleted-PDF-summaries. Sir, as i am new to this website got confused with your DPSP phrase…please elaborate that. Is it DPSP(Directive Principles of State Policy)? No, it is – Dear, Please Study Polity. I have the experience of 03 years of working in a Financial Institution as officer. Plus I belong to OBC category. As per the cumulative eligibility criteria of age,upper age limit in such case should be 30+3+3=36 years. That is,anyone in such situation with maximum Date Of Birth of 01/07/1982 is eligible to apply (as on 01/07/2018) as the notification suggests. But I am unable to fill the online application as the upper age limit year there shows 1985 only in the drop menu. Where I am getting wrong? Can I contact RBI on this ambiguity? If yes,then on which email ID ?